Show Me The Movies: Review: The Shape of Water - A Wonderfully crafted Oscar winning film that may not be for everyone! Review: The Shape of Water - A Wonderfully crafted Oscar winning film that may not be for everyone! With an underlying sense of injustice among some cinema goers at Three Billboards Outside Ebbing Missouri missing out on the Best Picture Academy Award among audiences to The Shape of Water on reviewing Guillermo Del Toro's latest fantastical fable, it's important to judge this film on it's own merits rather than any ill feeling that may linger due to the preference of Martin McDonagh's darkly comic drama over the Mexican director's other wordly fairy tale. Set against the back drop of the Cold War era America in 1962, this romantic fantasy drama feature tells the story of Elisa, a mute, isolated woman who works as a cleaning lady in a hidden, high-security government lab in Baltimore. As her life changes forever when she discovers the lab's classified secret -- a mysterious, scaled creature that lives in a water tank Elisa develops a unique bond with her new friend, she learns that its fate and very survival lies in the hands of a hostile government agent and a marine biologist. 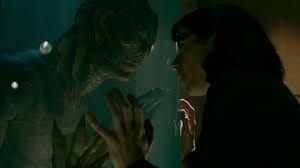 Anyone familiar with Guillermo Tel Doro's previous work (Pan's Labyrinth, Crimson Peak) will be aware of the director's vivid imagination, unique creativity and ability to conjure up visually stunning set pieces and The Shape of Water has all these qualities in spades, and lot more besides. Sally Hawkins who plays Elisa, is simply incredible in this film and is largely the emotional heartbeat of this highly original feature. To deliver such a performance using no dialogue is an outstanding achievement and one that was well worthy of the Oscar nomination she received. The supporting cast also excel here with Richard Jenkins, Octivia Spencer, Michael Stuhlbarg and Michael Shannon all adding their considerable talents to the production. It is in Guillermo Del Toro's outlandish, imaginative hands that this film really soars however with the original concept and it's execution delivered perfectly by a wonderfully crafted piece of film filled with extraordinary stunning set pieces, heart stopping thrills and overflowing with heart and emotion. It is worth noting however, that this film may not be for everyone. A bit like Blade Runner 2049 last year, this fantasy film will be appreciated a lot more by fans of Del Toro's work and may leave a lot of audience members wondering what all the fuss was about - but isn't that the beauty of great cinema? Overall, The Shape of Water is a beautifully constructed fairy tale filled with some incredible illustrative images and amazing performances and whereas it may not appeal to the cinematic masses is still a wonderful film.